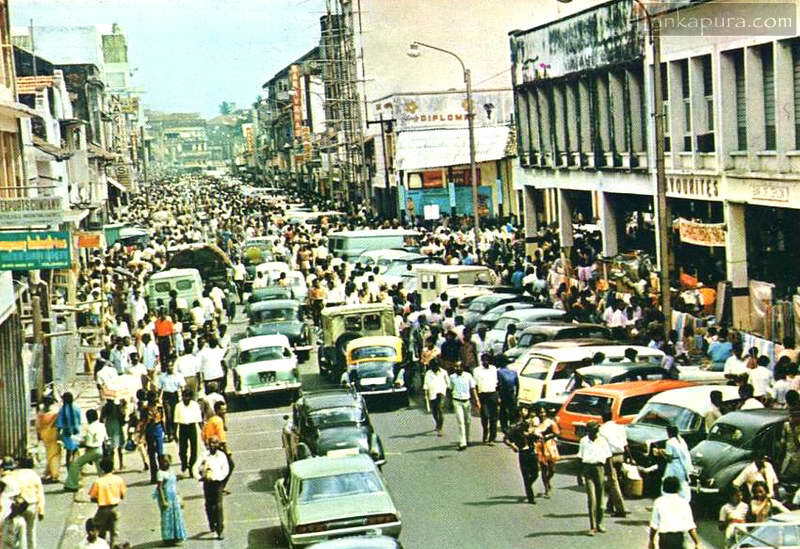 Main Street in Pettah is one of the busiest streets in Colombo, and the street is popular for gold and jewelry shops. this is a scene of Main street OK. It is not popular for jewelry but for textiles. The picture had been taken from the Khan clock tower end. You can see the sign board of ‘Favourites’ which is no longer exists, next to Titus stores. On a wall beyond that advertises the ‘Diplomat’ shirt a very popular brand of that era marketed by Maxim Ltd., Ratmalana. On the foreground there are few Morris minors, a Mitsubishi Jeep , a Hillman Minx and a Toyota Corona MkII clearly visible. I don’t think this is the 80’s, most likely the late 70’s judging from the cars. We definitely didn’t have yellow topped taxis by the 80’s.